[Shimon Hacohen] IC Sect 1. 115 British & Pal O.R’s. 245 British & Pal O.R’s. No 1 and 2 Sections of Company embark at 1700hrs for Alexandria Egypt on Polish Transport WARSHAWA. Dive bombed by Germans while anchored. Sail from Tobrouk 0600hrs to Alexandria, OC Capt A. W. Carnie with 2Lt HaCohen. Capt Arden still in Haifa training up 4 Section of the Company. Company on AA lookout duties. Troops paid. Arrive 1100hrs, along side Custom House Pier. Meet up with 2Lt Grimley and No 3 Section, 1039 PO Coy RE PAL, arrived on other transport. 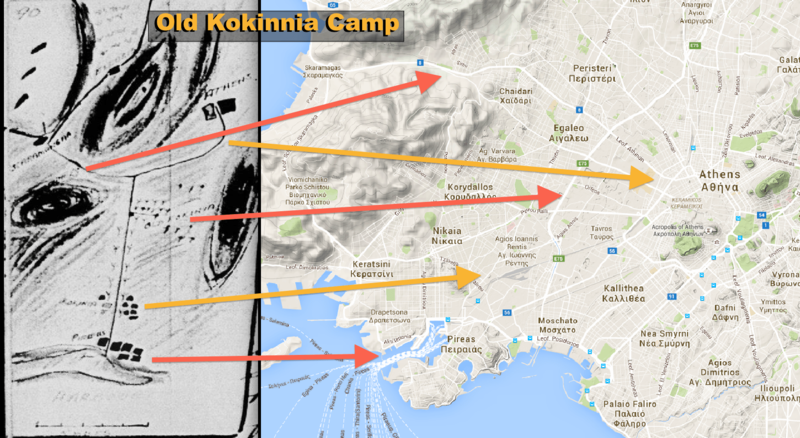 Marched 7 miles to “Old Kokinnia Camp” (OKC) on the Piraeus Athens Rd. Camp Commandant Royal Welsh Fusiliers. Received 2000 rations. Pitched tents for 250 men. 1 OC, 2 2nd Lts, 350 British & Pal O.R’s, with attached Australian personal 1 Lt RAE, Lt Kerr, 15 AIF Sappers. Reveille was at 0530 daily. Every evening I had a conference with the Docks Supt and in consultation with that officer, I arranged the current port operations at the Port of Piraeus and nearby localities. I attended conferences with the RE Docks personal to ensure that full use was being made always of all the port services in general, and the three sections of my Company in particular. Until active German hostilities commence against Greece, the stevedoring at the ports was being carried out by the normal Greek port labour. Only Italian air raids have, so far, been made upon Piraeus. As time went on, however, the local civilian labour was totally inadequate to cope with the abnormal volume of British Military traffic now pouring into the Port of Piraeus. Piraeus is a good port, and had been modernised by the provision of German travelling cranes and transporters, and was well equipped with very fine transit sheds and delivery banks. The road appropriate and railway facilities were all that could be desired for the quick transit of supplies through the port. Old Camp Kokinnia, among the olive trees in the fields, I arranged for additional tentage to be issued from Ordnance Depot, Athens, to accommodate the many units passing through this Transit Camp, and for the necessary rations for them. As far as possible, Greek labour was employed to the uttermost to stevedore supply ships. 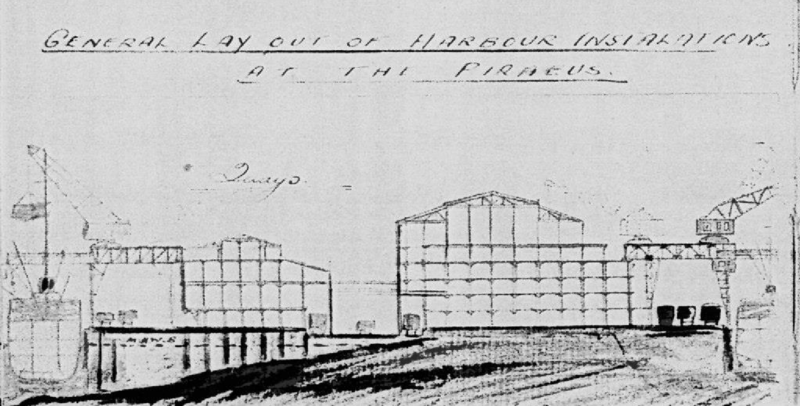 Army personal was utilised on the wharves to load motor transport and trains drawn up alongside the wharf shed loading banks, at ordinance and RASB supply dumps and transport stations generally. The Greek labourers did not over exert themselves, and there was a tendency on the part of these Greeks to be antagonistic towards my stevedores. To avoid positive congestion the Dock Supt ordered me to bring more and more of my stevedores alongside the Greeks and at the same time try to avoid friction with the similar labour. I put my men on ships with these people hoping that this competition would expedite the rate of discharge, and the work around of the ships. The skill of the Salonikan Jews as stevedore is proven and that they have had a monopoly in this type of work for centuries in the Levantine trades. I had recruited as many Salonikans as I could get into my Company as stevedores, and I now put them with the Greeks. Speaking the same language they soon became friendly and cooperative, and volume of movement increased. I impressed upon all ranks the need for secrecy in all matters of shipping intelligence & ship movements. With the heavy arrivals of each flight of troops and supply ships the need soon arose to operate other suitable ports to relieve the growing tendency of congestion at Piraeus, and the strain upon the inadequate lines of communication in this mountainous country of poor roads. Although Greece is rich in natural harbours, few can provide the necessary port facilities for the rapid discharge of heavy tonnage (i.e. wharves, jetties in their absence a good supply of proper lighters). And at that stage of the war landing craft had not yet reached the Middle East. At our movements and transportation conferences, therefore, it was decided to work Volos in the north with a section of my Company. These operations would be the discharge of heavy vehicles and supplies nearer the theatre of war operations. As already reported 2/Lt Hacohen was the only other officer who was fit to proceed in command of a section of this unit. And No 1 Section was the best one to move, where its operations would be outside my immediate control and supervision. This was the section which I had already used for similar operations. All personal had satisfactory experience in the handling of heavy lifts from ships to craft to shore to wharves. Accordingly, I dispatched No 1 Section, OC 2/Lt Hacohen, to Volos, and reinforced with selected key men. Reports which I subsequently received upon the operations of No 1 Section testified to the efficiency of the section and its commander. The outports of San Giorgis, Eleusis and Scaramangar in the Athens area were used to the uttermost capacity in addition to the uttermost capacity in addition to the many berths at Piraeus. I commanded the operations of No 2 & 3 Sections, and used 2/Lt Grimley, as was practicable. I made frequent adjustments in unit personal to ensure that all sappers gained the necessary experience in important key posts. As BM and P.T. Supt at Haifa, I was well known to many sea Captains, whose ships were regular callers, and I had often piloted, berthed and dispatched their vessels. Many Captains expressed their pleasure in seeing for once the right man in the right job. I did not spare my men as far as work was concerned, and I can report that my men willingly performed the lion’s share of port work, at the ports and harbour where this unit functioned. Among the activities in the field, I arranged for additional tentage… to be issued from …. Depot, Athens, to accommodate the many units passing through this transit Camp, and for the necessary rations for them. Measurements of Bulk Tonnage Stowage factors in c.ft.per ton. Germans bomb Pireaus. At noon this date German hostilities commenced in Greece, which was already at war with Italy. Volos Port bomb. Port destroyed and 2Lt HaCohen No 1 Section port operations ceased. Capt Carnie ordered to Khalkis with No 2 Section. Khalkis is the last remaining operating forward port. Capt Arden and No 4 Section arrive from Haifa, Capt Arden has been promoted to Major, and is now in position as Company commander. Capt Carnie arrives at Khalkis with No 2 Section to meet No 1 Sect and 2Lt HaCohen, to establish forward port operations. Men are billeted at an abandoned school house near the docks. No 1 Sect and 2/Lt HaCohen arrive. No 1 and No 2 Sections number 225 ORs. Remaining two Greek AA destroyed, leaving the port undefended. Loading Petrol Tankers “SS Volos” and “SS Katterina” under fire, both in record time, and sail to Crete. Burning ship offers a smoke screen from Stuka bombers. No 3 and No 4 Sections were ordered by Maj Arden to withdraw to Nauplion, to join 1003 Coy operations there. 2Lt travels to Athens for orders. The last forward operating port in Khalkis is ordered to cease operations and a withdrawal is ordered by Lt Col Hopkins, at Athens. Capt Carnie prepares for withdrawal and 2Lt HaCohen, with 20 sappers to manage any last transports and to destroy remaining supplies. Capt Carnie’s No 1 and 2 Sections join convoys moving south in the early morning. Dawn, No 1 and No 2 Sections meet up with Maj Arden and No 3 and No 4 Sec, who for unknown reasons are still at the Old Kokinnia Camp. 1300hrs stopped at well-wooded olive grove at the small railway station at Ano Lioni outside Athens. Maj Arden abandons vehicles and rations, delaying the Company’s movement south. Capt Carnie puts a lookout for any rail transport passing through. At 2300hrs a train arrives at Ano Lioni Railway Station, and Company personal board the train. Company moves to Peloponnese by train. The train crosses the canal at 800hrs and is forced to stop by Stuka dive-bomber attacks. The train stopped because of air raids. The troop were dispersed among the boulders on the mountain side. Many bombs dropped but did not explode. The driver did not want to continue. Eventually a Sapper officer drove the engine arrives at Argos at 1200hrs. March to Bivouac at Nauplion. Arrive at Argus at 1200hrs. March to Bivouac at Nauplion. Maj Arden leads No 1 Section in a single file. Capt Carnie then set off with No 2 Section, followed a little while later by 2Lt Grimley and No 3 Section and then by Lt Rooke with No 4 Section. 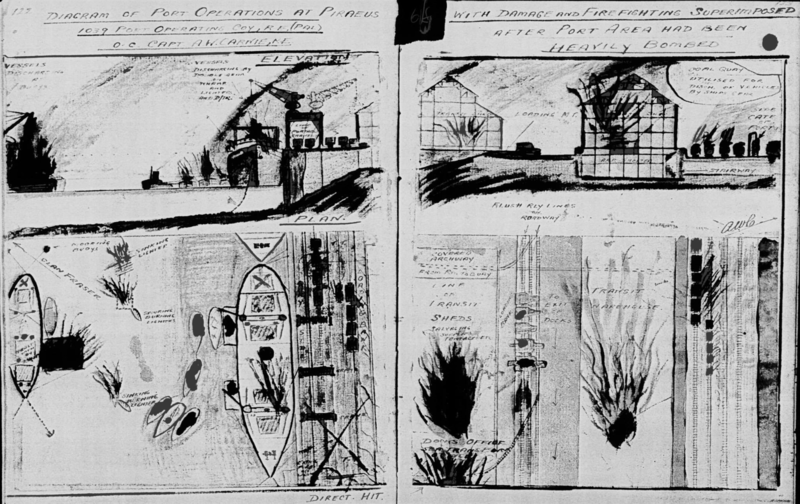 While the Company moved out, an air raid forced them into cover of Olive groves. Capt Carnie went back to the rear to the station, but could not find 2Lt Grimley or Maj Arden. The 115 ORs of No 3 Section was then led by a British Sargent. The Company marched down a dry riverbed for 5 miles, to a heavily wooded section on the beach at Nauplion. Then Capt Carnie went to the village to purchase all the “bread, milk, cheese and onions” he could find to feed “all ranks”. HMS Ulster Prince stranded in Nauplion Harbour, 2230hrs, blocking the evacuation. Major Godden, OC 1003 Docks Operating Company, had no operational orders for us. At night fall Capt Carnie and Lt Rooke remained with the four Sections of the Company in the same woods at Nauplion. Dawn. HMS Ulster Prince was set in fire by dive bombers. Before sunset, Carnie and Rooke led the Company out of the woods, during the last air raid of the day. They marched single files along twenty-foot banks of a dry canal. 2Lt HaCohen and 20 sappers returns from the Khalkis port operations, and rejoins the Company, informing that Comm Nichols RN escape by kyke to Crete. 2230 hrs Capt A. W. Carnie leads his men through the cover of dry canal, under Stuka attacks to evacuation point. He sees Maj Arden and 2Lt Grimley with some NCOs on trucks heading out to Argos. Grabs any trucks available to get all his men on the convoy with Lt Rooke, and “borrows” a motorcycle to follow his Company. Along the way he “saw stragglers floating it south along the road side” and where possible he picked up the men. The convoy proceeded all through the night, the vehicles driving with dimmed lights, upwards over the mountain ranges. Traffic jams were frequent on the hairpin bends on the steep passes, and sometimes vehicles crashed down the slopes and burst into flames in the valleys below. The Olympian scene, showing the long columns of vehicles, was lit up by the blazing trucks in the ravines, and burning ships off the coast. The skills of our drivers was exemplary, in manoeuvring their heavy overcrowded vehicles on these rough ledges of roads, especially when one considers the long hours of duty, with irregular meals and hours of rest, which had been mostly their conditions throughout the Greek Campaign. Arrival at Kalamai, a village 7 miles from coast and Port of Kalamata. 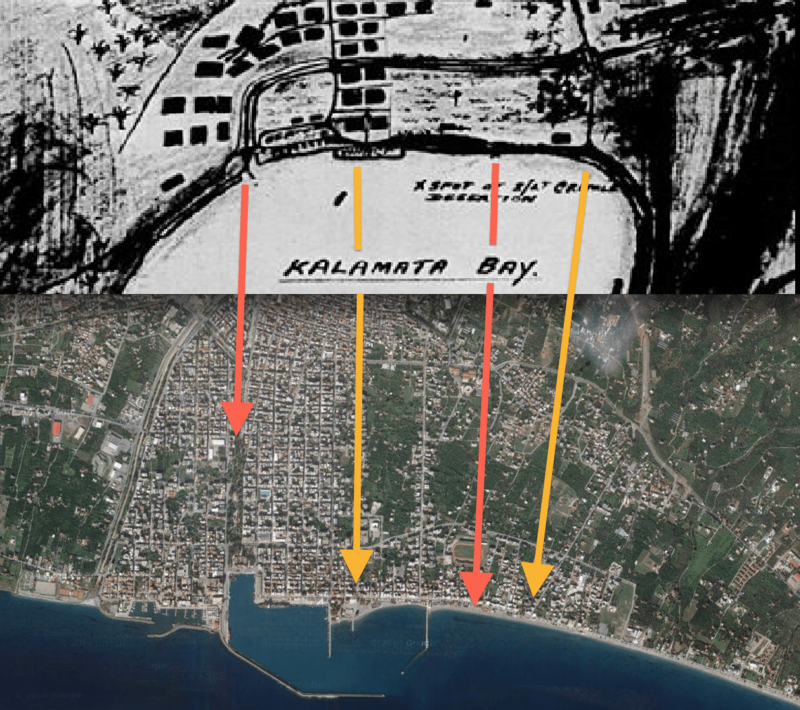 From daylight onwards the columns were attacked by single enemy planes, and the convoy arrived at a little village only 7 miles from Kalamata harbour. Motor Convoy ordered all vehicles under cover of the roadside olive trees because of the enemy air activity. At this village I asked Major Arden if he would report the nature of our unit to the Brigade Headquarters, in case Port Operation duties would be required during the evacuation of troops from Kalamata Port, which was now 7 miles away. I do not know if this was done. Although troops poured through the village all day towards the coast, we remained on Bivouac in this place until dusk. We then proceeded to an olive grove only one mile further south. It was a night of drizzling rain and few of the men had any kit, this having been abandoned by Major Arden on the 23rd April. I saw that the men spent as comfortable rest as possible, because I expected hard work ahead with the evacuation duties at the port. I went then and saw Major Arden in the farmhouse. I respectfully suggested that we might see about getting orders to push on to the Port of Kalamata. I thought that Brig Parrington would defiantly have important work for a Port Operating Company in manning ferry boats and other obvious duties at a small anchorage during the evacuation of ten or more thousand troops in this area, and the rear guard. My advice to Major Arden. I had a very earnest conversation with Major Arden, concerning the professional and technical duties and responsibilities, which I felt in this situation, as an experienced shipmaster and pilot officer, although from the military point of view I was now only 2nd in command. There was obviously so much that we could do and I felt our duty was to be at the port, the place for our military raison d’être. I doubt if it was appreciated that my men were skilled boatmen and harbour workers with a strong nucleus of deep water seamen, who under my command, were capable of operating steamers, sailing vessels and launches. I told Major Arden that I was willing to handle all available craft at Kalamata and, where few berthing facilities were at hand, the use of craft between shore and anchored ships would be of great value in the speed and volume of the impending operations of the evacuation by sea. However, we lay all that night, only seven miles from the Port. 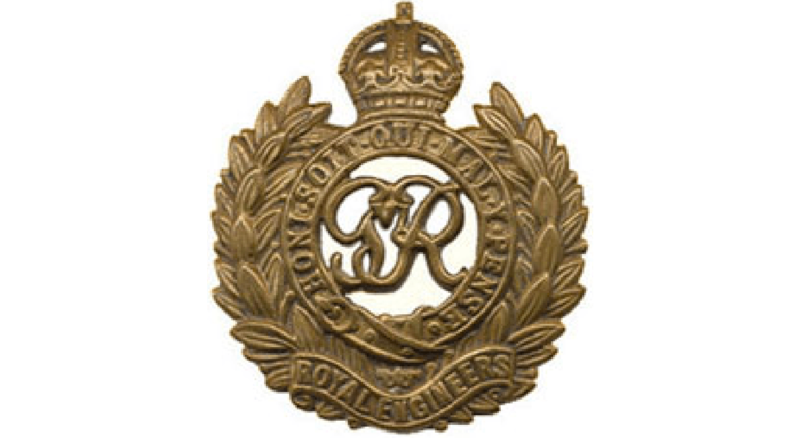 Arrangements were made for the British QMS to obtain a supply of Greek Bread and tinned rations and those were issued to individual sappers to carry with them. I regret to have to report that, at this stage, the junior officers expressed their dissatisfaction with the state of affairs. I had to exercise the utmost tact in handling this situation. I went and saw Major Arden about 1000hrs and asked him again if he intended visiting brig Parrington’s HQ. He said that he would. I appreciated both the military and technical position, and I saw the urging and opportunity for quick action. Events could be clearly foreseen. But at 1400hrs, when no contact had been made by Major Arden with Brig HQs, I asked permission to go and obtain orders or information. He agreed. I set off in a truck towards the coast. Two miles along the road, I was stopped by Maj Cary RTR. Near him, vehicles were been destroyed. I explained the position of my unit, and Major Cary ordered my to leap frog my men by any available transport to this point on the road, and then march to Kalamata Harbour. I returned to camp and reported this to Major Arden and after seeing that the men had rations and water, I organised and carried out the shuttle service for the 450 men with only three vehicles to the point of departure. I saw neither major Arden nor the three other officers until that night on the beach. Move on foot to Kalamata. I ordered British CSM Hold to lead the column, and the men to march in parties of ten in well-spaced single file. I carefully instructed all the NCOs to keep their men under cover of cactus bushes and other vegetation lining the deep roadside ditches and irrigation canals, detouring through olive groves were necessary, and to keep the men under organised control. I followed at the rear of the column, to satisfy myself that this were no stragglers. It was 1630hrs when I left Major Arden and his officers and proceeded in command of the Company. 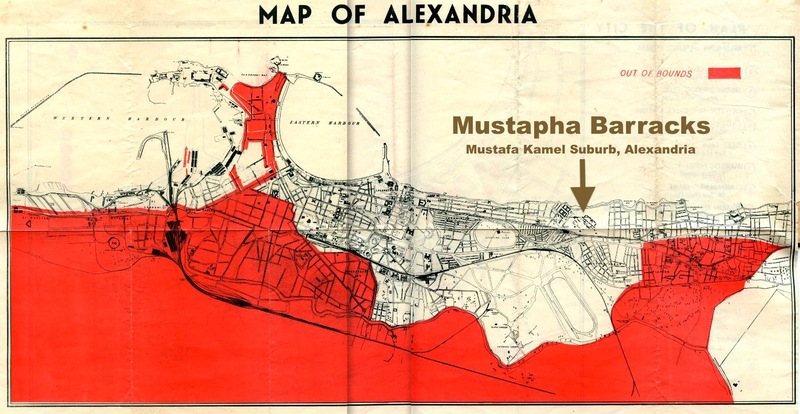 Three of my men were wounded by the roadside and our Italian dog from Tobruk was killed. I rendered first aid to my men and handed them over to a New Zealand medical officer, and ambulance, who was attending to casualties on the roads. The roads and villages through which we passed were thronged with British, Dominion and Near East Colonial troops. Enemy air activity was brisk, and bombing and MG fire was heavy, especially when passing through the town of Kalamata, on our way to the sea. Nightfall reached sea shore at Kalamata. Night had fallen when we reached the beach and I had accounted for all my ORs [other ranks]. I reported to a Movement Control Officer who ordered me remain on the spot. As I was standing on the beach near my men, two British Army Captains approached. “What are you guys going to do?” one said to me. “I’m going on board the first ship that arrives” said the other. “That’s what they did at Dunkirk”. “Where are your men?” I asked. “They can look after themselves” one answered, “Only a bloody fool would stop and be caught like cattle”. When I asked these officers who they were, because I intended reporting them, they both disappeared into the darkness on the crowded beach. About 2100hrs Major Arden and his officers arrived and the whole Company with other units waited on the sea shore. MC Officers said that troops had been embarked the previous night and the ships had sailed not loaded to full capacity. In the meantime, I walked along the water’s edge and saw a number of useful sailing Kykes of 20-30 tons, drawn up on wooden shipways on the beach. These craft seemed fit for launching and capable of being handled by my men for ferrying troops, just as I had advised Major Arden. Before dawn, about 0500 MC ordered all troops under cover before daylight. I moved my men to a deep rocky wady [dry river] to the east of the town. The boulder, trees and bush offered good cover and blast protection for the men, and I had the position reinforced and camouflaged where necessary. I remained on this position all day with 2Lt Hacohen and 450 ORs and I saw none of the other three officers until after dark that night at the water’s edge. As was to be expected, strong formations of enemy aircraft resumed their bombing and MG fire upon the port, and all visible or likely British positions. There was no active AA defence. I went down the course of the dry wady to a culvert over the eastern road approach to the town, to keep in touch with communications. I could not find bde HQs I contacted a NZ unit who provided me with a truck load of rations, which I distributed to my own troops and to others in the vicinity. To obviate the exposure of our position by disorderly troops in search of drinking water, I organised and took charge of a water carrying party, but we were seen from the planes and machine gunned. However we obtained a sufficient supply. At 1700hrs I heard artillery and small arms fire from the direction of the town. Shells fired up the wady and burst on the hill sides above my positions. I assembled my men and had a roll call under cover. Then as dusk came, I led my men down the wady towards the shore, and the firing increased. On reaching a road leading into the town, I met a Brig Major and he asked me what troops and commanded. I told him, and he ordered me to take up a defensive position on the left flank of a line running nearest to the sea. I explained briefly that my men were unarmed. He replied that it was Brig Parrington’s orders and placed my men as quickly as possible in the required positions. My lines ran from the sea through an olive grove and hedges to a stone wall. On my right flank [NE direction] an Australian unit was forming up. I obtained .45 ammo for my own pistol and a supply of .30s for my Lieutenant from the Australian Unit. On my front line I placed my only arms, the 12 British NCOs interspersed with sappers, who although they had no official British Army arms training, claimed to have knowledge of firearms. Some Jews had picked up picked up rifles found abandoned on the roads. Then I posted the main body of unarmed Palestinians along the entire length of my position, and this created an illusion of strength, if the Germans tried to break through our position. Fighting was going on in the town between the Germans and the British-Dominion Forces. The enemy had placed a howitzer on the water front a quarter of a mile away from our position, and were shelling the beach and British positions continuously. The firing gradually subsided and I was informed that the enemy been driven off and prisoners taken. 2Lt Grimley. Disobedience, abandonment of post and desertion. He (2Lt Grimley) would see that the men lay flat on the sand at the water’s edge in parties of ten, this being an estimated boat load; and this organised system would make for easier and more speedy embarkation in any boats, which might arrive, when the unit received official orders to proceed to the anchorage ships. I strongly reiterated these vitally important points in the present situation to 2Lt Grimley, and told him that I would return in a few minutes with the next party of his men. I returned to the main body of my Company where the British officers and the NCOs where organising the personal into parties of ten. I sent the second boat’s party back across the strand towards the spot I had left 2Lt Grimley and his first party of ten men. The time between my leaving 2Lt Grimley post and my return to his post was only seven minutes. I could not see 2Lt Grimley. His ten men were on their feet at the water’s edge exposed to the enemy MG fire from the bluff, shouting in their various languages, gesturing, and in a wild state of excitement. They pointed to a disappearing boat pulling rapidly to seawards. I calmed the men down, and they told me that a boat had put in to the beaches during my brief absence. Before it had grounded on the sand 2Lt Grimley ran towards the boat and jumped aboard, shouting “Keep back, keep back, the Germans are here” they said. When the men tried to follow their section Commander they all confirmed that he pointed a pistol at them as they stood on the sand, and the boat backed quickly to seaward. All ten Palestinian substantiated this evidence of this officer’s incomprehensible action, and I clearly saw the boat myself, only 15-20 yards from the shore. By the sound of the boat I was sure that the occupants thought that we were Germans. I hailed the boat and shouted “Grimley! Come back”, but to no avail, and it disappeared into the darkness towards the ships lying in the Bay. 2Lt Grimley having thus deserted his post and abandoned the men under his command, I put Br CSM Holt in his place and resumed the movement of personnel to the beach then I reported the incident to Major Arden. The situation was well in hand as far as I could judge from this section on the beach. Earlier in the evening, the Germans, for a short while, had occupied the jetty, but had been now driven off and were held in fixed positions. Prisoners had been taken on both sides, among whom was Capt. Clark Hall RN STO Evac Ops. This officer’s capture meant the loss of the Code Books for communicating with the Navy. There was a possibility of mines near the jetty, and the Navy would not Berth ships alongside, and the ships remained out in the bay. Even the shallow draught Destroyers did not close the beach on account of possible mines. Later on, when evacuation operations commenced, only ships’ boats, necessarily too few, were the means of communication between ships and shore. I proceeded along the water’s edge and saw the evacuation of wounded being carried out by dinghy. Beyond the empty jetty I saw the craft on the shipways, and called up my seamen with the intention of launching them. But since I had seen them the previous night, they had been damaged by air attack, and others had stripped planking, done possibly by their owners to avoid requisition by us. I found none were seaworthy, but I sent men to get petrol tins and blankets to make floatable, and to look for hammers and nails. None were, obtainable, however, and my tools and repair materials had been jettisoned at Athens. But for this deficiency I would have had a number of these craft in a serviceable condition in short time, and running them between ships and shore, to expedite embarkation. Rumour of impending capitulation was now rife among the many thousands of troops, assembled on the beach, but discipline was good. Shortly after midnight I heard that the flotilla had been ordered to sail because the Italian fleet was in these waters. Although the trend of events was deteriorating I thought hope was not lost. I felt sure that a stand would be made during the coming day, and a further attempt would be to evacuate when night came, either or on the other side of the peninsulas. It was my intention to procure a supply of nails and repair the boats and launch them, as soon as darkness fell. These craft with the prevailing wind could evacuate my entire company of same seafarers, if only I had got the orders. Two weeks previously, in my capacity of OC, I would have had no hesitation in embarking on this particular scheme. About 0100hrs, only one ship remained in the bay. CSM SECHER reported that he had found a small boat and asked for orders. I could not see Maj Arden and time was short, I ordered CSM [Company Sergeant Major] Sechar to take the men he had with him, and as many as the boat would hold , out to the ship. If he caught the ship and it were about to sail, he would cast the boat adrift, but if possible he must come back for more men. No more boats could be seen. I was later informed that this party reached Egypt. I waited on the beach with my men for the remainder of the night and at dawn I saw a German Staff Vehicle approaching with a flag of truce. Capt. Kennard IV Hussars, was seated in the car. I was still uncertain of the real military situation, because the Germans had been defeated the previous night. However, about 0545, I met Major Arden, and he told me that Brigadier Parrington had capitulated as from 0530hrs, for the purpose of avoiding futile bloodshed. Maj Arden ordered me to parade the Company for surrender. 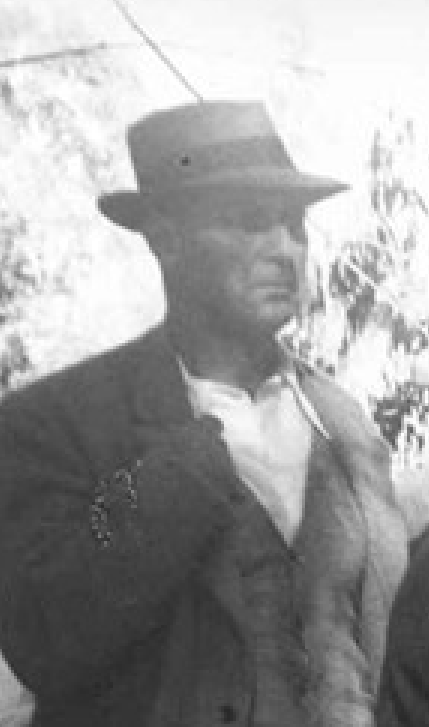 I assembled the Company ( only one L/Cpl killed at Kalamata) and I separated the German born other ranks and destroyed their pay books and all evidence of nationality in case of possible victimisation by the Germans, especially those who had escaped from concentration camps during this war. I advised them all as to their answers during possible interrogation, and braced them up in spirits as I could in the circumstances. I then ordered the British NCOs to bury their arms and ammo, and I did the same myself. Shortly after, a force of Germans Troops appeared and we were marched off. POW Camp Held in a wired off perimiter on the beach, before been moved to the rail side yards near the Custom House. POW Camp Men railed of to the military barracks at Corinth, that once housed the Italian POWs. The men caught at Nauplion are also brought here. POWs from the Battle of Crete start to arrive at the Corinth POW Camp. The following extract is taken from the diary of “Sapper Fred Carne” who kept a diary throughout his time as a POW. Fred was captured at Kalamata. After enduring a grim month in a prison camp in Corinth, the POWs were moved. Left Corinth. Marched 11 kilometers, crossed canal. Arrived Kalamorka, board train for Athens. Jammed in like sardines. Greeks good to us. Stop at Athens, have rations, Board train again. Get ready for a long march. Arrive Grayia at 4 am. March over famous Thermopylae Pass, 32 miles of dust and hell. 100’s fall out, 5 die on the way. Proud to say I made it, but only just. Dead beat, sore, stiff and hungry. Arrive Lamia. Another bridge blown. Walk 3 kilometers more, very sore. Greeks are great – throw food to us at risk of being shot. One boy killed. Got out of truck to get bread. Jerry will pay for it. The boys go mad but can’t do anything. A night of hell. Arrive Salonika, can hardly move. Jerry gets us out at point of bayonet. Walk 5 miles under terrible conditions. Beat to the wide, sleep on square in the rain. Thousands here, can get no food. Sick and weak. Up at 3 am. Get searched, move to other barracks at 5 pm. Jerry goes mad. Marched a Greek girl and kid plus a boy up to the barracks for punishment. Hit woman with baby, just for being kind to us. Pouring with rain. Can’t move a step more. Feeling ill. Every part of me aches. Everyone the same. Thousands in this camp as well. Food very poor but Red Cross gives us an egg each. My stomach is terrible, pain is wicked. Out at 5.30 am, roll call at 6, breakfast at 7, dinner at 12 am, tea 6 pm. All the meals put into one would not make one decent one. Jerries change bread that the Greeks bring us for our watches. Boiling hot by day. Kept on parade for hours but feeling better. Getting over the soreness but still ravenously hungry. Tempted to change watch for bread but still hanging on to it. 2000 move out for Germany. We get sorted out. Out turn next. Food terrible. Jerries raise the devil. Takes very little here to get shot. Several boys die. The last few days have left their mark. Malaria breaks out and spreads. Water here is not fit to drink. Get issued with pills to check the fever. Will be glad to get out of this hole. One chap dies after eating whole loaf of bread. Got a donkey for meat. Better than nothing. Happy event, found small piece in the soup. What I would give now for a square meal. Still starving. We are kept on parade for 2 or 3 hours at a time in the boiling sun. Tons of sickness and several deaths. Scores of lads still suffering with their feet from the march, as some did not have boots. Getting ready to move off. Draw 4 days rations. Half a loaf of bread, 3 biscuits and tin of bacon. Some boys eat the lot in one go. Going to chance their luck on the journey. After waiting hours, put off until the morning. After all day waiting we move off at 5 pm. Wait outside station until 9 pm. We get jammed in truck. So many men impossible to move. Air terrible, doors locked. Lie on top of each other. Everyone in a mess. Shocking night. Take it in turns to sleep but with doors closed it is hell. Air is foul, can’t get water. Two petrol tins in truck, one for water the other for lavatory – throw it out of the window. Get soup very late at night. 3 boys escape out through window at night. Trucks dirty and lousy. Sweat pours out of us and lice crawling everywhere. They won’t open the doors. Several boys have dysentery. The old tin is being used some. Stink is shocking. Get soup at Belgrade from Red Cross. First time we get out since the journey began. As the doors open the girls get shocked by the smell. Jerry takes all our knives away as the boys cut holes in the truck to let in air. We are all filthy dirty, full of lice and dirt, smelling wicked. Nearly mad with hunger and thirst. Jerry won’t listen to us. After a lot of buggering around we arrive at Wolfsberg, a real prison camp. Can hardly walk. Lots of stretcher cases. Got a bit of bread and, what a thrill, a bit of jam. Tastes like the best I ever had. 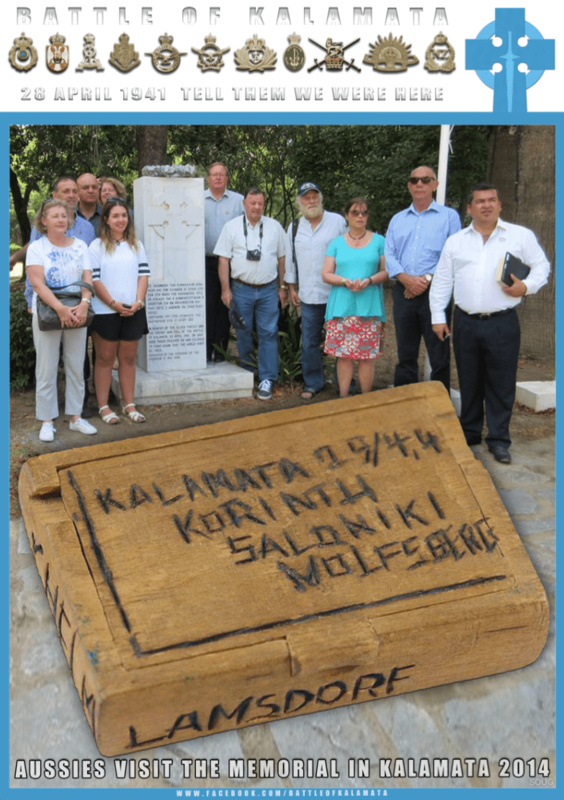 Memorial by The Brotherhood of Veterans of The Greek Campaign 1940-1941 at Kalamata, and carry box marking the varies POW camps by a Jewish British Mandate volunteer. During my captivity I made several unsuccessful attempts to escape. About the end of March 1945 my final Camp Oflag IXA was broken up and the British Officer personnel was marched by the Germans in a North Easterly direction. Although sick and suffering I succeeded in evading the German guards near Mauthausen on the 1st April. I remained in a village until it was captured by the American 6th Armoured Division, of the 3rd Army at 1220hrs on 4th April 1945. I was flown home by the American and British Air Forces, arriving at 91 Reception Camp, on the 12th April 1945. NB: Leslie Herbert Grimley made it to Egypt and transferred on 22.07.1941 to the Royal Army Service Corps. In 1942 he was promoted to Captain, and his commission was finished in 1946, at the end of the War. He passed away in Canberra Australia in 1980 aged 77.